The capital of Italy is renowned for monuments expressing the power of emperors, popes and dictators. 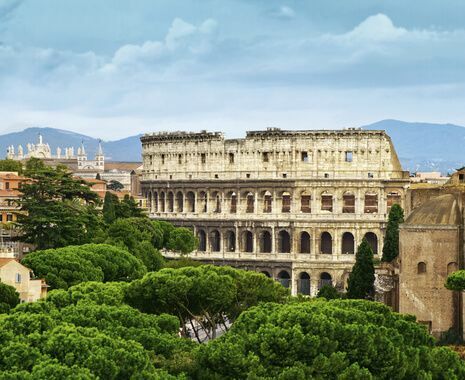 This tour explores how the emperors from Augustus to Constantine created a language of symbols that has resonated down the centuries, shaping Rome as ‘the eternal city’. It will focus on the art and architecture of Ancient Rome, from the Forum to the Capitoline Hill, with the chance to discover ‘hidden’ aspects, such as megalomaniac Nero’s Golden House and Trajan's markets, which are still being excavated. Hadrian built his own palatial villa complex outside the city and incorporated architectural elements from across the empire. This tour involves some long walks over uneven ground and therefore requires	a good level of fitness. Please note that the exclusive and individual nature of private visits means that	they are subject to confirmation nearer the time of departure. Also, churches, private houses and other buildings often	have fluid	opening times. If any visits have to be rearranged, please be assured that we will seek alternatives of equal interest. Dr Nigel Spivey is a senior lecturer in classics at the University of Cambridge, teaching classical art and archaeology. He has written extensively on the history of art; titles include Greek Art, Enduring Creation and How Art Made the World (the latter was a major BBC / PBC television series).